The annual produce of the land and labour of any nation can be increased in its value by no other means, but by increasing either the number of its productive labourers, or the productive powers of those labourers who had before been employed. ~ Adam Smith, The Wealth of Nations, Book II, Chapter III. The Des Moines Register published an article that the value of Iowa’s crops and livestock sales would reach something close to $30 billion this year, triple the value of ten years ago. A big part of this change is driven by dramatically higher commodity prices. Most or all of this year’s corn crop will be sold for more than $5 per bushel, for example, whereas the average price received by farmers in 2000 was $1.90 per bushel. There also has been an increase in the productive capacity of grains and livestock in the last ten years. Yields, of course, fluctuate from year to year, but they trend upward. Average yield for corn in Iowa in 2000 was 145 bushels/acre and is projected to be 167 in 2011, for example. In 2009, a better growing year, corn yields averaged 182 bushels/acre. Productivity can increase in other ways to increase the value of crops and livestock. It’s the application of innovation that sparks my entrepreneurial interest in particular. 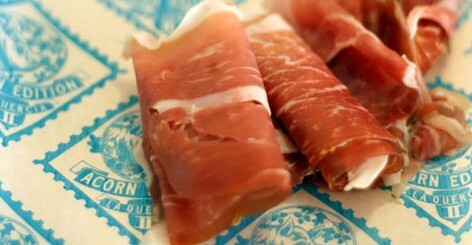 An example is La Quercia, a company in Norwalk that sold its first aged, prosciutto-style ham in 2005. Now it sells tens of thousands of them, along with other associated pork products, throughout the U.S. I can’t say I’ve had anyone from either coast say anything much more pleasant about where I live. Iowa, the land of great prosciutto! La Quercia is run by Herb and Kathy Eckhouse. I met Herb in the 1990s when we both worked for Pioneer Hi-Bred International, the global seed company. The Eckhouses had lived for three years in the 1980s in the Italian city of Parma before moving back to Des Moines. They had picked up a taste for all things Italian and Herb started to experiment with aging hams. La Quercia has moved well beyond experimentation. The company’s headquarters is a 50,000 square foot facility. A big part of that space is occupied by state-of-the-art refrigeration units. These units are set up to mimic the seasons in terms of temperature, humidity and air movement, and replicate the ancient process of curing hams. La Quercia’s hams are sweet and on the low end of saltiness for cured meats, with a delicacy that is touted by chefs, food critics, and food publications. In 2007, as sales of La Quercia products really accelerated, Bon Appetit magazine, a premier food publication, awarded the company its Food Artisan of the Year award. Feature articles on the company have appeared in the New York Times, the LA Times, Cooks Illustrated, Serious Eats, Chicago Magazine, Saveur, the Chicago Tribune, Edible Communities, and The Art of Eating. La Quercia’s artisan pork is produced using dry curing based on traditional Italian methods. This is a millennia-old method that involves salting and drying to preserve meat and then aging to develop flavor internally. No nitrates, nitrites or their vegetable-derived substitutes are used in curing. A maximum of three ingredients are used, pork, sea salt and spices, depending upon the product. With the exception of a small quantity of pork that comes from pigs fed acorns (for a nutty meat flavor), most of the pork purchased by the company is fed a fairly standard ration of corn and soybean meal. The Eckhouses have explained to me that they want their products to reflect Iowa’s terroir, and that includes corn and soybeans. Their focus on a high-quality, high-end product adds value that makes other pork and ham products pale in comparison. The company’s Prosciutto Americano will sell at retail for around $40 per pound. Other, higher-end prosciutto made from organic and acorn-fed pigs may retail for more than $200 per pound. Iowa’s agricultural landscape will continue to be represented by those engaged in creation of products on the lower end of the cost scale. However, La Quercia is an example of how to apply innovation to a specialty market segment and in the process create new value for corn, soybeans, and pork produced in Iowa.